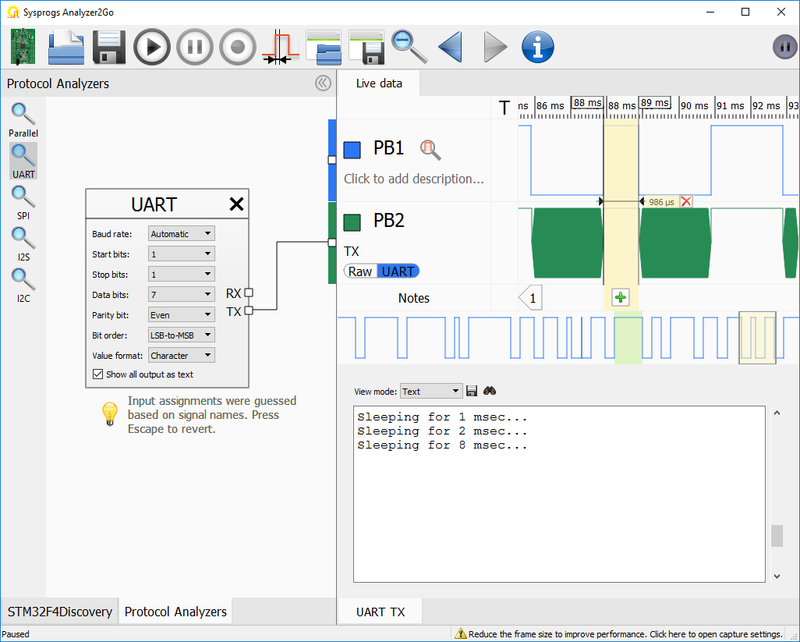 In this tutorial we will show how to use Analyzer2Go to quickly decode the captured UART output. 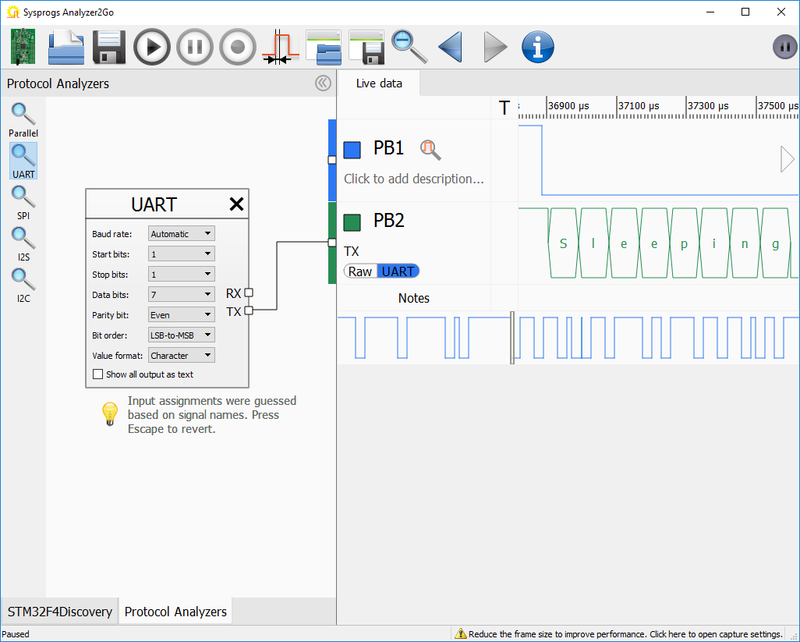 Before you begin, follow the basic Analyzer2Go tutorial to ensure it works with your hardware. We will use 2 boards in this tutorial: one STM32F4Discovery board will run a simple program that picks a random number, prints it to UART and waits for the corresponding amount of milliseconds. The other STM32F4Discovery board controlled by Analyzer2Go will be used as a logic analyzer. We will use it to capture the UART output and verify that the actual delays match the expected ones. While looking at the bits manually may be useful for diagnosing complex timing issues, in most of the cases it would be unnecessary complex. 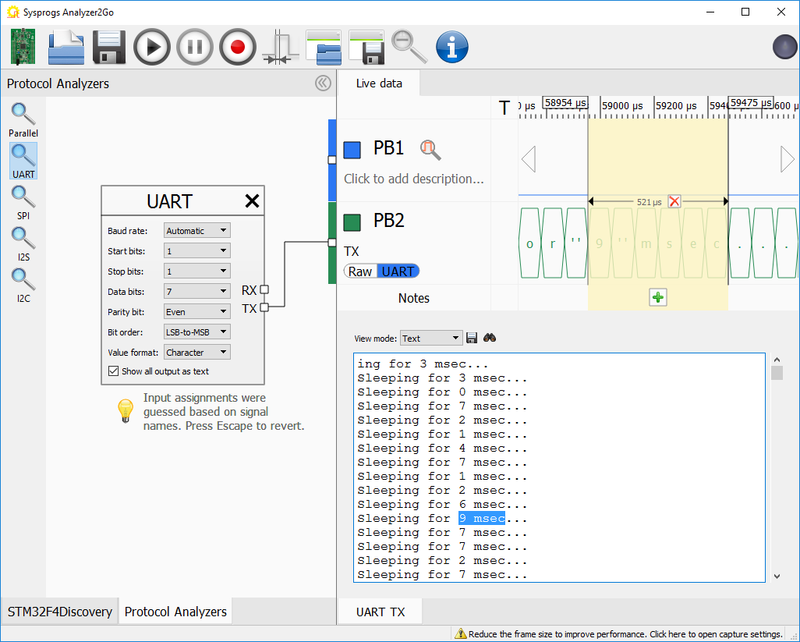 Analyzer2Go provides a convenient mechanism of decoding the output manually. 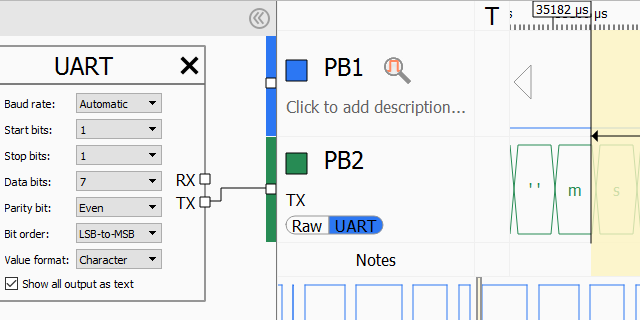 First, change the description of the PB2 signal to ‘TX’ so that Analyzer2Go can guess its meaning from the name. 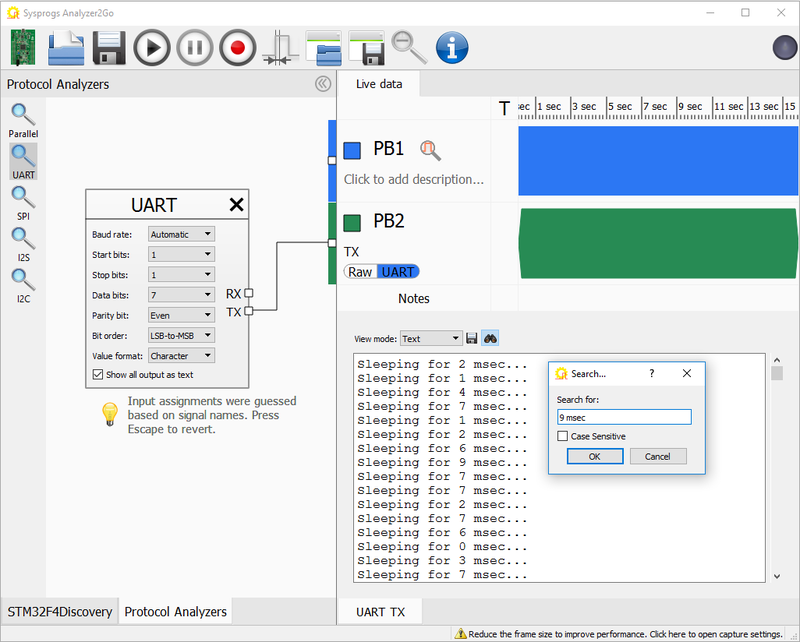 Then go to the Protocol Analyzers page and drag-and-drop the UART analyzer in the work area: It will automatically recognize the “TX” input and replace the raw signal there with decoded UART values. You can change various decoder settings (e.g. 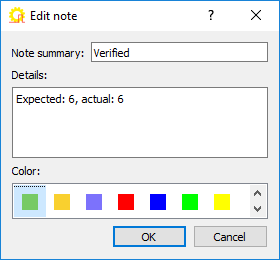 parity mode) in the Protocol Analyzers pane. 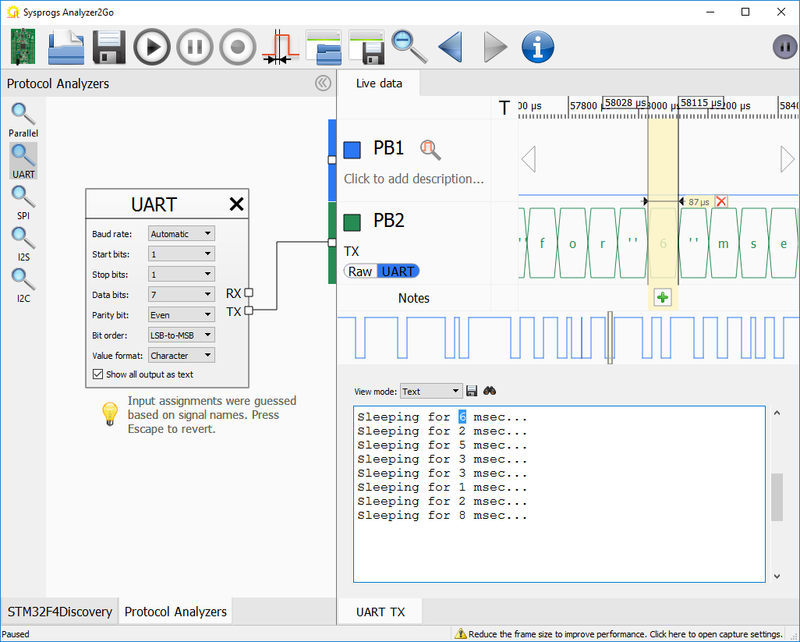 Check the “Show all output as text” checkbox to automatically decode all of the UART output within the captured frame: Note how selecting text in the text area will automatically select the corresponding time span in the signal view. 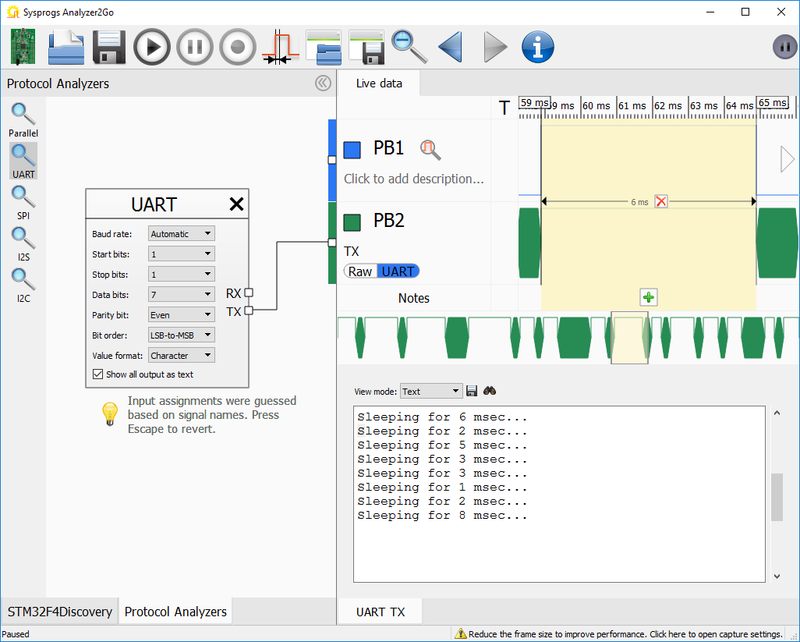 Starting from version 2.0 Analyzer2Go is compatible with the Cypress SuperSpeed Explorer Kit, supporting continuous capture at 200MHz via the fast USB 3.0 interface. Check out the SuperSpeed tutorial for details.